Believe it or not, but you don't have to blog to have a profitable online business. If you’ve followed my blog at all, you would see I’ve been on a blogging hiatus for a few months. A year ago, I would’ve imagined this crushing my sales and client attraction. Yet, the opposite happened. I’ve received more requests to work with me since I’ve stopped blogging. I’ve received more sales since I’ve stopped blogging. And I’ve received more media opportunities since I’ve stopped blogging. Many of us who are in the depths of online business can’t imagine breaking our blogging routine. But maybe the thing we struggle to let go of is the very thing holding us back. You see, a few months ago I came across an entrepreneur who was at the level of business I wanted to be at. He had the freedom, he had the wealth, and he had a life full of meaning. I wanted what he had. But as I observed his success, I noticed something: he had a blog but didn’t blog. Instead, he was utilizing other methods to build his online business. Blogging—he described—had become unnecessary for him. And yet, his business was still growing at a rapid rate. Before this moment, I hadn’t given myself the opportunity to think about the value of blogging in my business. All I knew was I’m a copywriter, so I have to blog. But once I had given myself the chance to consider not blogging for a quarter, I experienced tremendous results. I say all this not because I want you to stop blogging. Instead, I want to expand your thinking. 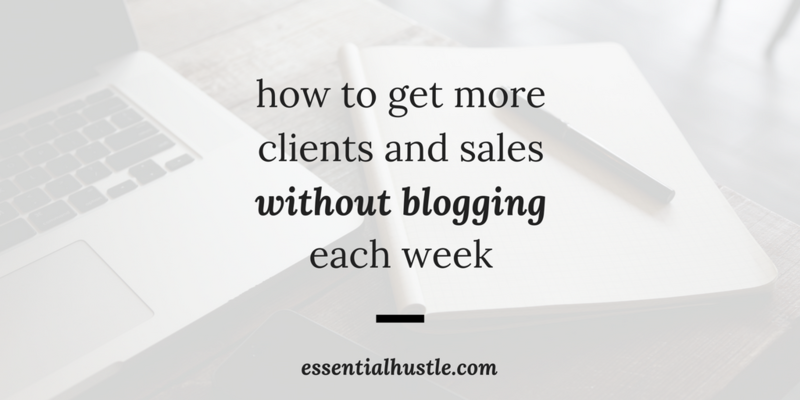 You can get more clients and sale without blogging every week. You can find alternative ways to grow your audience and sell more of what you have. You don’t have to be as dependent on blogging as you are. In my blogging hiatus, I’ve discovered other ways to get more clients and sales online. And by implementing these other methods in my business, I’ve increased my business, and have positioned myself in a scalable way. First off, I took the energy I was using to blog each week, and instead used it to generate more referrals for my business. I had discovered that my best clients were always the ones who were referred to me—so I leveraged this. I reached out to my friends in the area and asked them to refer me to anyone who needed a copywriter and marketing consultant. Doing this resulted in a $3500/month increase in my business’s revenue. Sometimes we get so caught up in unimportant tasks that we miss leveraging the opportunities that’ll actually provide results. So consider this for yourself: will blogging or increasing your referrals get more sales for you? 2. Build an unstoppable funnel. This was the big change I invested in this quarter. While increasing referrals is a great way to generate quality clients and sales fast, it also requires your time. It’s difficult to scale when your primary method of attracting clients and sales requires your daily involvement. This quarter, I identified that I needed a pipeline for getting clients and sales without my daily involvement. This is where a sales funnel comes in. A sales funnel is simply a mechanism to guide casual subscribers into becoming loyal clients and customers. Without an automated sales funnel working for you in your business, you’ll always be the freelancer/course creator hunting for sales and unable to scale. An automated sales funnel—I discovered—is the only way to build a stable online business. I believe more online businesses need to generate money in a way where they’re not forced to hustle every day. Sales funnels do this. So this quarter, I invested much of the energy I spent blogging to building out a sales funnel for my business (and my clients). Performing this action makes my blogging more effective because now I know: any subscriber who joins my list after reading a blog post will go through a proven-to-work funnel. Do you have the same? 3. Invest in the business. And finally, if you want to grow your business without blogging every week, consider the many ways you can put money back into the business to grow your business. Invest in Facebook ads that pull people into your unstoppable funnel. Invest in going to conferences with your target audience. Invest in hosting an in-person meetup in your town. Invest in a virtual assistant who does outreach for you. All of these investments don’t require blogging each week, but can greatly increase the number of leads who go through your business pipeline. This was the main thing I realized this quarter: I need to make more smart investments in my business. Are you making the investments you know will scale your business without blogging? So now, as you can see, I’ve made my triumphant return to blogging with a renewed sense of purpose to my blogging. In my hiatus, I’ve discovered many of us blog simply because everyone else is blogging. Not many of us have taken the step back to analyze the impact of blogging on our business. We are simply doing without asking ourselves why. For the longest time, this was me. And my blogging was in vain. But now that I’ve taken a step back and seen how I can generate sales without relying on blogging—I admit—my blogging has become better. Don’t fall into the trap of thinking blogging is a necessity for your business. Always keep an eye on the factors that bring in the most sales for your business. And if blogging is not that, feel free to let it go. My suggestion to you, if you were to go on a blogging hiatus like I did, would be to use this time to build out a sales funnel. With a sales funnel getting sales for you, you don’t have to blog as much as you are now. So let me leave you with this: you have permission to not blog for business—but only if you’re using your blogging energy for other, more productive things in your business. If blogging does provide results for you, then stick with it. But if not, feel free to let it go. Our business is only as powerful as we allow it to be. And sometimes that means getting out of our own way and putting in place pillars for future growth. I agree Cris! Thanks for reading!